This open access book describes the results of natural language processing and machine learning methods applied to clinical text from electronic patient records. It is divided into twelve chapters. Chapters 1-4 discuss the history and background of the original paper-based patient records, their purpose, and how they are written and structured. These initial chapters do not require any technical or medical background knowledge. The remaining eight chapters are more technical in nature and describe various medical classifications and terminologies such as ICD diagnosis codes, SNOMED CT, MeSH, UMLS, and ATC. Chapters 5-10 cover basic tools for natural language processing and information retrieval, and how to apply them to clinical text. The difference between rule-based and machine learning-based methods, as well as between supervised and unsupervised machine learning methods, are also explained. Next, ethical concerns regarding the use of sensitive patient records for research purposes are discussed, including methods for de-identifying electronic patient records and safely storing patient records. The book’s closing chapters present a number of applications in clinical text mining and summarise the lessons learned from the previous chapters. 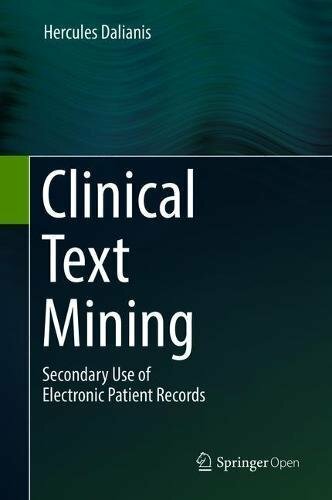 The book provides a comprehensive overview of technical issues arising in clinical text mining, and offers a valuable guide for advanced students in health informatics, computational linguistics, and information retrieval, and for researchers entering these fields.